This beautiful rose colored Strawberry Sherbet takes roasted strawberries, all soft and glistening in their juices, and mixes them with sugar, a little lemon juice, yogurt and heavy cream. It has a creamy smooth texture and fresh strawberry flavor that is lovely on its own, but you can also serve it with lightly sweetened strawberries, or with a little raspberry or strawberry sauce poured over top. 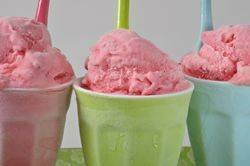 A sherbet's texture is like ice cream, only it is much easier to make as you don't need to make a custard base. Actually, when you look at this Strawberry Sherbet recipe, you will see that it is remarkably similar to the Strawberry Soup recipe on the site. Both use strawberries that are mixed with agave, light corn syrup, golden syrup or honey and roasted in a moderate oven until the color of the berries intensifies and they soften and release some of their juices. I find that roasting strawberries really highlights the strawberry's bright red color and sweet flavor. It is also a great way to use strawberries that are a little past their prime. Once the roasted strawberries have cooled all you need to do is to puree them in your food processor, along with the rest of the ingredients, until smooth. The final step is to chill this mixture and then process it in your ice cream machine. The sherbet can be served straight away or placed in a plastic container and frozen. If frozen, it will need to be softened slightly before serving, which can be done by placing it in the refrigerator for about 30 minutes. Strawberry Sherbet: Preheat your oven to 300 degrees F (150 degrees C). Lightly oil a baking sheet. Wash and cut the strawberries in half (or quarters if using large strawberries) and toss with the corn syrup. Place on a the baking sheet and bake in the preheated oven, stirring occasionally, until the strawberries are soft and the syrup is thick, about 40 - 50 minutes. Remove from oven, let cool, then place in your food processor or blender. Add the remaining ingredients and process until smooth. Transfer to a large bowl, cover, and place in the refrigerator until chilled (several hours or overnight). Transfer the mixture to the chilled container of your ice cream machine and process according to the manufacturer's instructions. Once made, you can serve it straight away or transfer the sherbet to a chilled container and place in the freezer for a couple of hours before serving. For longer storage you may have to transfer the sherbet to the refrigerator for about 20 -30 minutes before serving to soften.